Ah well I mucked it up. Didn't read Michelle's page correctly and so have already finished next week's scattergories ... definitely a Type A personality which I have recently discovered is not good. So for this week there are more photos to demonstrate how differently we all think. Animal - well at this time of year the most obvious one would be the YULETIDE GIFT BEARER. I was intending to photograph one of the reindeer but we didn't receive even one card with a reindeer on it this year so I suppose it had to be the big guy himself. Then when you think about it he is the real gift bearer rather than his trusty steeds. School Days - I realise this isn't what we would like to think about for school days but both Paul and I came up with the same response and so I figured it must be accurate. Although not as youthful as he once was I still feel he makes a fair fist of the YAWNING YOUTH. Now last but no least is green - another easy one as I have been busily making YELLOW AND GREEN YO YOS. Have decided that I may as well have some fun with this blog stuff and what better way to start than with an organised event. I definitely have an ordered mind ... well sometimes that is. Firstly the kitchen item ... this is my son's VIOLIN. He loves the reverberation that occurs when he plays in the kitchen and so often does his practice there. How many other people are serenaded whilst they wash the dishes. Mind you he does object to the interludes when he is required to dry the dishes. Secondly was the car equipment ... where would be without our air VENTS ... yes I realise in this day and age we could wind down our windows but that's very old hat and good for the environment also. Last but not least was office equipment. Well the toss up here was between my poor fading african violets which I have brought home in an attempt to revive them or my VENERABLE VICIOUS GUARD DOG protecting his valuable xmas pig's ear. As it is the beginning of the year I thought I shouldn't start with something that shows what a failure I am as a gardner and so here is the venerable canine. OK so it is blatantly obvious I don't work in an office but I am certain that both of these items are must haves in a modern office. Well I think I am getting there. I have set up a few blogs so that I don't have everything cramped into one site. This one will be my blog while the others are going to be storage spots ... not really interesting but good for my accountant like mind .... everything in it's own spot! Ok have finally worked out how to get a blog...well truth be known this isn't my first but I am hoping to be able to remember the address on this one and actually use it. I am planning on doing the Take it Further Challenge this year. will post more info once I work out what I am doing but here goes can I find this site again ..... that was the problem with other sites but now we shall see. Signing off and hoping to find my way back here! Not a bad effort for first quilt. Richard came up to ask for my help just a month before his girlfriend's birthday. He wanted to make her something personal and thought a teddy bear would be perfect. Small and therefore easy! You have to love that logic. After a bit of discussion he decided that perhaps I had more idea of what was easy and manageable in the sewing area than he did and so he embarked on a quilt. Day 1 was selecting fabric and cutting .. after a few almost lethal swipes he managed this reasonable well. Day 3 ... now the adventure began... using the sewing machine.... an easy task ... his design was QAYG nine patches. 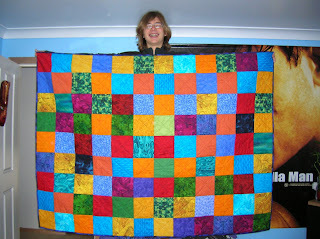 Hey this was really easy and it only took two days to put together his 12 blocks .. only making a lap quilt. D Day minus two.. yes the birthday is in two days and most of what needed to be done on Day 5 still needs to be done. At this stage Richard figured that when I had been nagging him it was perhaps because he had a lot left to do. 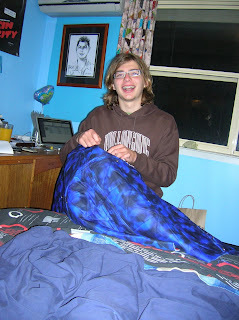 For the two days prior to Jess' birthday either Richard or I worked on the quilt for over ten hours per day.